From oval- to round- to emerald-cut and from diamonds to sapphires to emeralds, these celebs are rocking some seriously enviable bling. Here are a few of our favorite celebrity engagement rings. Justin Bieber popped the question just a few weeks ago, making Hailey Baldwin one lucky girl (and owner of one of our new favorite celebrity engagement rings). Alexa Ray Joel, singer/songwriter and daughter of Christie Brinkley and Billy Joel, became engaged to boyfriend Ryan Gleason this past Christmas while on vacation in Turks and Caicos. Alexa’s ring is an emerald-cut center stone set in an art deco-inspired filigree. When George Clooney popped the question to Lebanese-British human rights lawyer Amal Alamuddin, he spared no expense, doing so with a seven-carat emerald-cut diamond. Set in platinum, the ring is estimated to be worth more than half a million dollars. Despite the gorgeous ring, Amal has recently been spotted wearing a simple platinum band, as she feels the diamond is too ostentatious to wear to work every day. Ariana Grande became engaged to SNL writer and actor Pete Davidson after just a few weeks of dating. 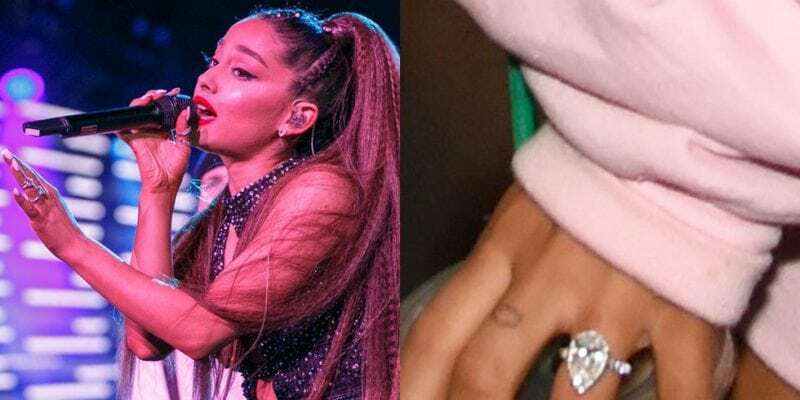 Ariana’s ring, a massive pear-shaped diamond, is rumored to be worth close to $100,000 and was commissioned by New York jeweler Greg Yuna. Blake Lively was the envy of every girl when she became engaged to Ryan Reynolds — even more so when she showed off the bling he had given her! 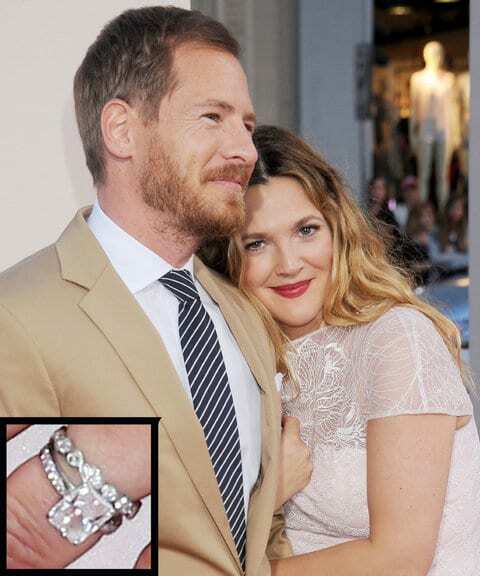 Blake’s ring, designed by celebrity jeweler Lorraine Schwartz, is a seven-carat, light pink oval diamond set in rose gold and complemented with pavé diamonds. Not only is Jay-Z great at producing albums, he’s pretty good at picking out engagement rings, too. 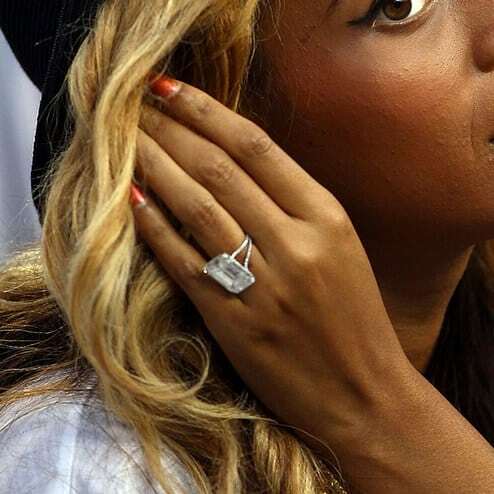 Beyoncé’s ring is an 18-carat, emerald-cut, flawless diamond solitaire designed by Lorraine Schwartz. 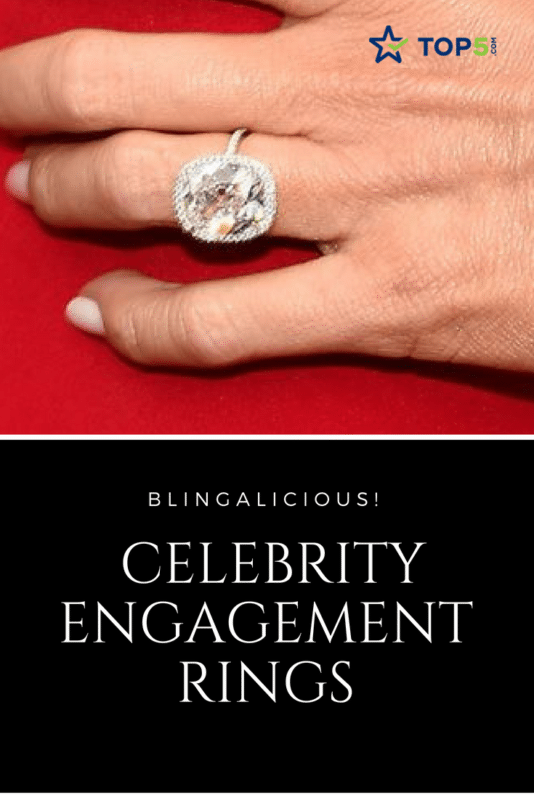 The ring is valued at more than $5 million and one of the more expensive celebrity engagement rings on our lust list. R&B singer Ciara got engaged to Seattle Seahawks quarterback Russell Wilson in 2016 while vacationing in Seychelles, and the two were married shortly thereafter. 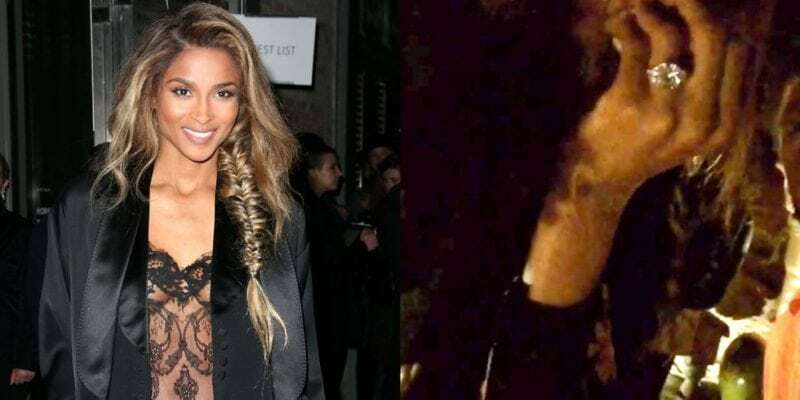 Ciara’s ring is approximately 16 carats and estimated to be worth somewhere between $2 and $2.5 million. “Ummmm so this happened….#Engaged #Dubai #Happiness” Eva Longoria posted on Instagram in 2015 to announce her engagement to Jose Antonio Baston. Jose proposed while the couple was vacationing in Dubai and presented Eva with a ruby-encrusted engagement ring. After her “conscious uncoupling” with ex Chris Martin in 2014, Gwyneth Paltrow has once again found love. Gwyneth confirmed her engagement to Brad Falchuk in early 2018 and was recently spotted at the Producers Guild Awards sporting a gigantic sapphire stone on her left hand. Halle Berry is another celeb who opted for a colored stone as opposed to a diamond. The actress, married to businessman Olivier Martinez, wears a four-carat emerald stone set in yellow gold and flanked by two smaller diamonds. Olivier commissioned the ring from friend and jeweler Robert Mazlo, and it’s one of the more unique celebrity engagement rings we’ve come across. Irina Shayk is a Russian model who has graced the runways of Victoria’s Secret. She is also the mother of Bradley Cooper’s child and, more recently, his fiancé. While the notoriously private couple has yet to comment on their engagement, Irina has been spotted sporting an emerald engagement ring. Hockey star Mike Fisher proposed to Carrie Underwood in 2009 with a fabulous canary yellow diamond estimated to be five or six carats. Surrounding the yellow center stone is a diamond halo; the ring also has pavé at its shanks. Carrie and Mike married in July 2010 and have one child, a son, Isaiah. Jessica Biel became Justin Timberlake’s main gal five years ago. In addition to landing the singer-heartthrob, she also landed a pretty sweet rock. Jessica’s engagement ring features a large center stone weighing approximately six carats. A pavé halo surrounds the center stone and is flanked by side stones of aquamarine, Jessica’s birthstone. Kim Kardashian rocked a 20-carat cushion-cut diamond engagement ring designed by jeweler Lorraine Schwartz. 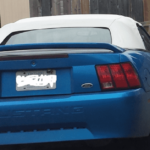 It was stolen during the now-infamous Paris hotel robbery. Kanye West had popped the question by leaving the brilliant bauble on Kim’s pillow. 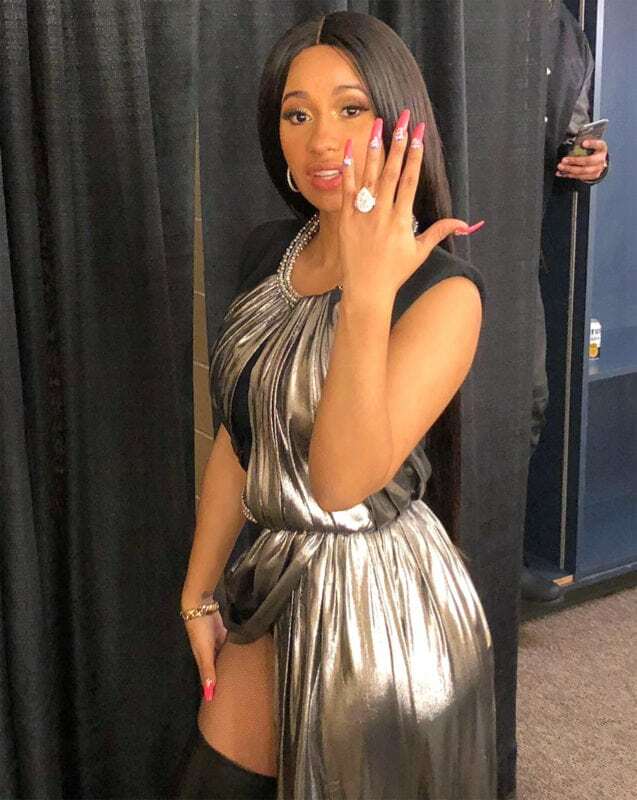 Grammy-nominated Cardi B received a ginormous eight-carat tear-shaped stone surrounded by pink and white diamonds from rapper Offset in October of 2017. The bling is reportedly worth over $500,000. 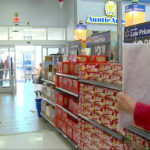 Although the couple made their engagement public in October, they had actually secretly married the month prior in a small, intimate ceremony. Fashion mogul Mary-Kate Olsen married French businessman Olivier Sarkozy in 2015. Mary-Kate’s ring matches her own unique style: a vintage Cartier, purchased from a Sotheby’s auction (for $81,250, according to records), the ring boasts a four-carat center diamond surrounded by a sapphire halo and set in yellow gold. The Royal Wedding of Prince Harry and Meghan Markle was full of hidden sentiments. Meghan’s ring is no exception. 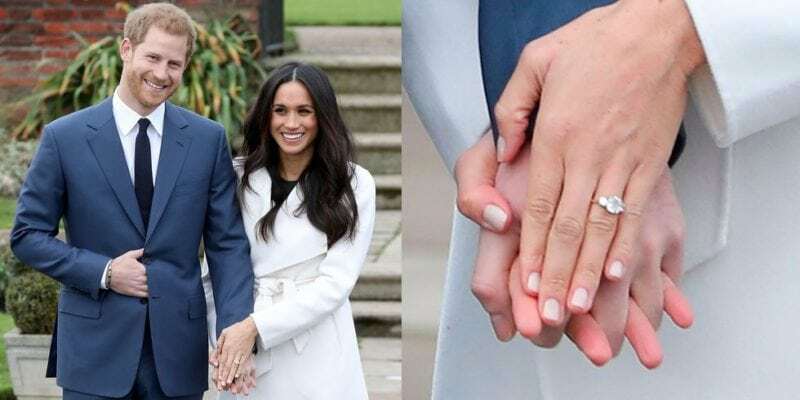 When Harry popped the question to Meghan, he gave her a three-stone ring that he had designed himself. The three-carat cushion-cut center stone was from Botswana, where the couple had spent much time together, and the diamond side stones were from Princess Diana’s collection. 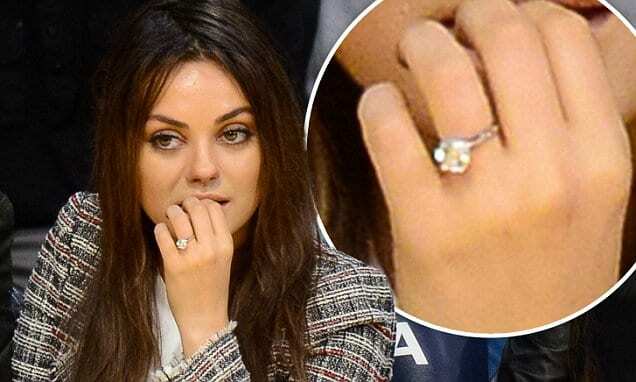 Mila Kunis was the lucky girl who took Ashton Kutcher off the market in 2016 when he gave her a five-carat Tiffany solitaire diamond ring. These days, however, Mila is seen sporting a simple band she bought on Etsy for only $90. 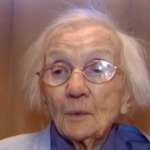 In fear of having her $250,000 Tiffany ring stolen, she keeps it in a safety deposit box. Miley Cyrus met Liam Hemsworth on the set of The Last Song in 2009, and the two have had an on-again, off-again relationship ever since. They became engaged in 2012, split in 2013, and reunited again in 2016, when Miley was spotted once again wearing her engagement ring. 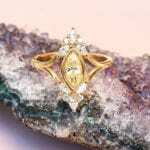 The ring is an art nouveau piece designed by Neil Lang. It is a 3.5-carat cushion-cut diamond set in yellow gold and flanked by intricately carved diamond floral motifs. Model Miranda Kerr and Snapchat founder Evan Spiegel became engaged in July 2016 after two years of dating. They were married in 2017 in a simple backyard wedding. Miranda’s ring is a classic round-cut diamond centered between two tapered baguettes. The center stone is estimated to be between 1.75 and 2.5carats with a price of $75,000 or more. Jason Sudeikis not only has great taste in women but in jewelry as well. Jason proposed to Olivia Wilde with a Victorian-inspired ring: a round center diamond surrounded by an emerald halo and set on a thin yellow gold band. Paris Hilton confirmed her engagement in January 2018 to DJ Chris Zylka after two years of dating. Chris proposed to Paris on a mountaintop in Aspen with a massive pear-shaped diamond rumored to weigh 20 carats and boast a price tag upwards of $2 million. Pippa Middleton met her now-husband, financier James Matthews, in 2007, but the couple didn’t marry until 10 years later. 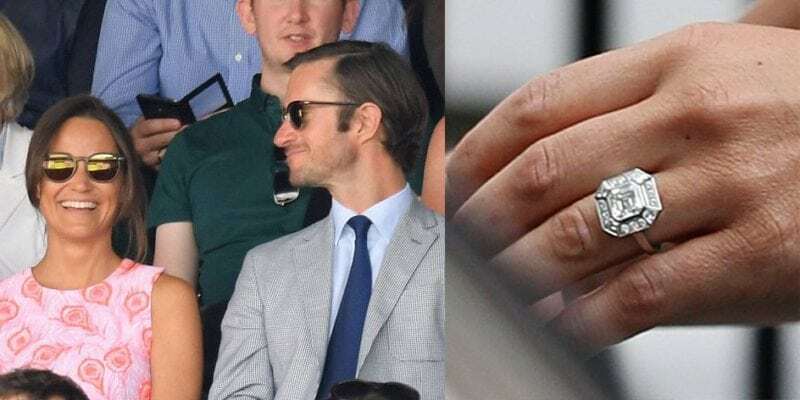 Pippa’s ring is a vintage Art Deco-inspired ring. The center stone is an Asscher-cut diamond estimated to be approximately three carats, surrounded with an octagonal halo of smaller diamonds. Fashion blogger Rumi, and BFF influencer and blogger Chiara Ferragni, became engaged to photographer Christopher Dowson in April 2017. Rumi’s ring is a classic round-cut solitaire center stone. But set on a gold band, unlike many of today’s diamond solitaires, which are set in either platinum or white gold. Scarlett Johansson’s celebrity engagement ring is a stunning and unique piece of Art Deco jewelry. Journalist Romain Dauriac selected the vintage-inspired ring, which features a one-carat cushion-cut center stone along with multiple accent stones for a total of 1.2 carats. The ring is set in white gold. 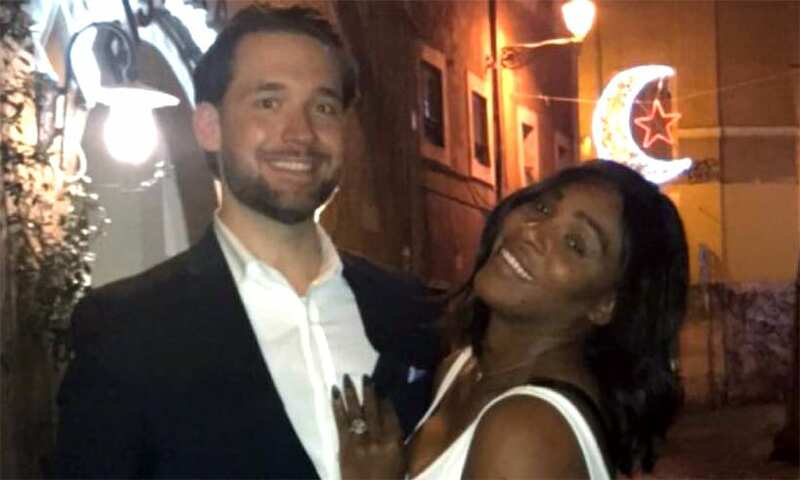 Serena Williams married Reddit cofounder Alexis Ohanian in 2017, and the couple share a daughter together. Serena’s ring is an emerald-cut stunner and is reportedly worth $2 million. Her wedding band is nothing to scoff at either: the band contains three pear-cut stones as well as a teardrop diamond that creates a halo around the center stone of her engagement ring. Actor Joe Manganiello popped the big question to Sofia Vergara in December 2014 with a large oval-cut diamond engagement ring. The pair met at the White House Correspondents’ Dinner in May 2014, when Joe was caught checking out Sophia’s derriere. Sophia says this was their icebreaker, and they still laugh about it today. 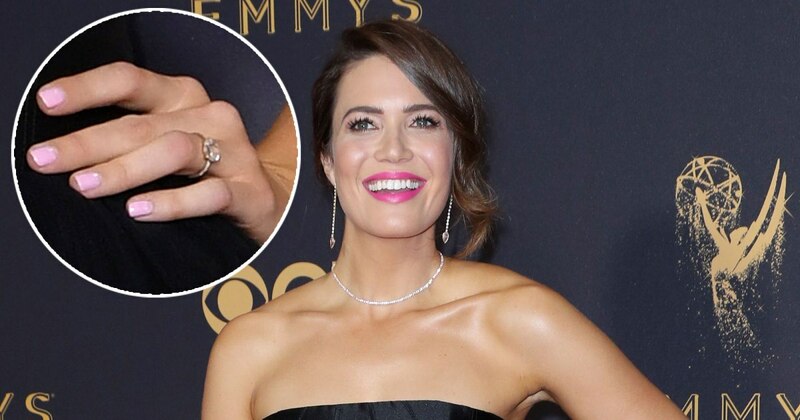 Mandy Moore and Taylor Goldsmith got engaged after two years of dating. Moore said that she doesn’t really like jewelry, but she is in love with this ring because it’s customized gorgeous ring. In 2015, the two lovebirds, Kirsten Dunst and Jesse Plemons, met on the set of Fargo. They fell in love fast and got engaged only two years later. 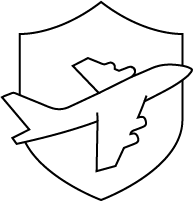 Recently, they welcomed their first child together in May 2018. Ruben Torres was Hilary Swank’s tennis coach when they fell in love and got engaged after a year of dating. Unfortunately a month later, the couple split for unknown reasons. When Zooey Deschanel and Jacob Pechenik released to the media that they were engaged, there was also more big news. The couple announced that they were expecting their first child together. After a year of dating, Barrymore and Will Kopelman took a trip to Idaho. During their vacation, Kopelman proposed with a stunning ring. 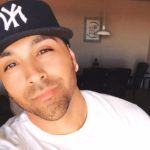 As of 2018, the couple is no longer together. The ring is amazing though! Chiara Ferragni, fashion blogger and influencer behind @theblondesalad, met her now-husband, rapper Fedez, in May 2017. Fedez proposed to Chiara on her 30th birthday on stage at one of his concerts. Chiara’s ring is a classic-cut round solitaire diamond estimated to be upward of three carats. Amber Heard was the lucky recipient of not just one, but two engagement rings from former husband Johnny Depp. The first featured a five-carat round central diamond surrounded by smaller diamonds. The second is a bit small but just as lovely. Vintage-inspired, it features a diamond-embellished bezel set on a band with intricate scrollwork. Which of these celebrity engagement rings is your favorite? Tell us in the comments!